Sony 6 Band Receiver AM FM PSB SHORT WAV TFM-8000W TFM 8000W Vintage RADIO 1972 . Good working condition, but antanna is damaged. No reserve. Condition is Used. Thanks for looking. Shipped with USPS Priority Package. WORLD BAND RECEIVER. It is staffed mainly by volunteers. We are located at 103 S. Grove Avenue in Oak Park, IL. INCLUDES: RECEIVER, CASE, ANTENNA AND LITERATURE IN ORIGINAL BOX. Item is pre-owned but appears to have not been used. Receives AM, FM, continuous shortwave, and SSB (single sideband). High-quality circuitry and a digital PLL tuner. But while the identification number in the FRG series got larger going from "7" to eventually "8800", the resulting performance did not improve remarkably. Then things changed in 1993 when Yaesu introduced it's FRG-100 into a market already populated by the likes of the Ken wood R 5000. Nothing beats a Bare Copper Long wire Antenna for Shortwave Reception. Nothing. Perfect for Shortwave, LW, AM DX and General Communications Reception. 05khz to 54 Mhz. Simple, classic design and installation. TECSUN PL-660 Portable general coverage receiver. Excellent condition, lived on my nightstand. Nothing beats a Bare Long wire Antenna for Shortwave Reception. Nothing. Perfect for Shortwave, LW, AM DX and General Communications Reception. 05khz to 54 Mhz. Simple, classic design and installation. Neues AngebotGRUNDIG MINI WORLD 100 PE 6 BAND SHORTWAVE AM FM PORTABLE POCKET RADIO, NICE!!! 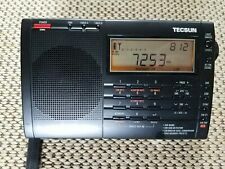 GRUNDIG MINI WORLD 100 PE 6 BAND SHORTWAVE AM FM PORTABLE POCKET RADIO, NICE!!!. Condition is Used. Tested and works fine. Shipped with USPS First Class Package. Vintage Philips / Magnavox Radio D1835 - 9 Short Wave Bands AM FM LW SW. Speaker works and sound fine. *** needs antenna or use external one see photos for details!!! Will be well packed and shipped fast!!! Thanks!!! Vintage Magnavox Radio D1835 - 9 Short Wave Bands AM FM LW SW. Condition is Used. This radio receiver was made in China. Notice that the clock and tuning information are currently working (see picture number 7), and that's because I have installed three high-quality AA 1.5V Lithium batteries from Energizer. 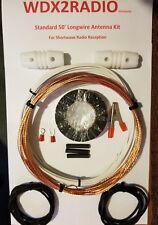 Can be combined with all WDX2RADIO Shortwave Antenna Kits. I have been fascinated and involved with all forms or radio and Communications Radio since 1966. I am all about simple, big bang for the buck solutions and results. Let us lay the cards on the table and list the features found on this radio all of which contribute to its value Operationally, the radio has been carefully tested and works beautifully with no known issues or problems. Grundig YB 300PE AM/FM Shortwave Radio. I do not have attachments for radio functions. Clock and AM/FM radio both work. We tested the radio on fresh batteries and it worked just fine. One of Drake's better radios was the SW 8 manufactured in the 1990's for about 5 years. With the radios strength in reception, you will be able to receive communications for hundreds, if not thousands of miles. The Yacht Boy 400 is praised in the Passport To World Band Radio as "Best performance for price/size category. right up there with very best among world band radios.". Coverage is complete including long wave (144-353 kHz), AM band to 1710 kHz and shortwave from 1711 to 30000 kHz. And it's also been reported that the "TINY-TENNA" gives amazing results on FM stereo's and police scanner's! The "TINY-TENNA" operates on a readily available nine volt battery. (Not included.). It can also operate on a very inexpensive AC adapter. Just removed from service and works fine- recently was set up with 2 receivers- in the past had been used with 5 receivers. lower 48 states only. includes 3 coax jumpers for outputs, one BNC interconnecting cable, and multiple BNC to PL259 adapters. Icom has a nice history of providing receivers for the amateur and shortwave listening market. Without going into the full history, for the sake of the shortwave listening community out there, the receivers in the general receiving range were introduced in 1982 with the highly regarded R 70 receiver. The initial introduction, the NRD 505, reportedly made less than 1,000 units and this receiver broke new ground for enthusiasts with it's high construction standards and precise digital readout. Here is a list of the DSP features on the 545. Available as shown grundig yacht boy 400 world receiver 40 stations. Used, good condition. Antenna inner screw is loose/missing and will need reattaching. Comes in original box with instructions and even original receipt. Also included is a compact antenna. Minor cosmetic wear. It does work fine; as is what you see is what you get. Payment appreciated within 3 days from auctions end. Shipping and handling will be 11.99. Boxed with plenty of secure padding. This receiver is optimally equipped with the selection of 5 bandwidth filters and should appeal to a wide variety of listening situations for both shortwave and amateur radio DXers. This R7 has been optimized by Gilfer for shortwave listening with the exceptional filter selection and we will discuss this in detail below. When the Icom sync detector was installed in earlier manufactured units (it was deleted from later units), it had issues like easily losing lock and also sub-par performance. Kiwa provided two major upgrades to the synchronous detector and they combine to enhance performance to enable the PLL to remain locked under the most difficult signal conditions. Over the years, we have sold a couple hundred (or more) of the JRC receivers. Thus, while all JRC receivers may be produced in a reasonably limited quantity, the model NRD-345 is a lot more scarce. Shortwave Magazine Review 1997. This receiver was manufactured in Japan from 1983-1992 and originally sold as a top performing, but modestly priced unit. It is capable of receiving from 150 KHz to 30 MHz uninterrupted tuning using a range of listening modes. We tested the radio on fresh batteries and it worked just fine. These 800's were manufactured for four years and the vast majority of them were manufactured during the first two years. One of Drake's better radios was the SW 8 manufactured in the 1990's for about 5 years. Over the years, Palstar has manufactured the R30 receiver which has minor differences to the R30A. There may be more things to compare, but you get the idea. Both emphasize substance over style. Dual Collins filters for 6 and 2.5 KHz in all modes. 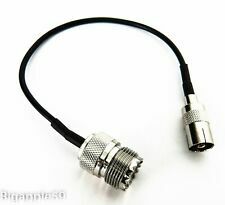 Can be combined with all WDX2RADIO Shortwave Antenna Kits. I have been fascinated and involved with all forms or radio and Communications Radio since 1966. Here is our solution to the problem of running antenna lead in wire into the house. Other features are Gilfer Shortwave catalog page copy - 1993. This sale is for a used Drake R8 communications receiver that is in good condition, but not perfect. The unit has a few marks that are typical with age and use, but nothing really outstanding. This Grundig Mini World 100 PE is a compact am/fm/shortwave radio. It has a leather case and an extending antenna. It works well. Realistic SW-100 Multi-Band Radio AM/FM Shortwave AIR Police Weather Ham VHF Vtg. Condition is Used. Shipped with USPS Priority Mail. Front cover is missing to keep flap on without falling open see photo. Otherwise in good working condition. Includes leather pouch. We are the authorized USA distributor for Franzis Kits. When assembling this radio, the photos are self explanatory. Other than this kit all that is needed is a solering iron, solder, 4 AA batteries and a 9 Volt battery. In our listening shack, we have a variety of radios. AOR AR7030 sale flyer. AOR AR7030 preliminary brochure (4 pages). This CD contains over 330 MB of files, is not for sale, and is only supplied to the new owner of this receiver. No box but I do not believe this 9 band world receiver has ever had batteries installed. It is still in the clear bag, unsealed, and includes the original instructions. Batteries are NOT included.